The Senate has passed the Federal Anti-corruption Law regarding Government Contracts. It is expected to be passed by the lower house in the course of 2011, probably before the end of the congressional term. Mexico is a member state of the United Nations Convention against Corruption, the Inter-American Convention against Corruption and the Organisation for Economic Cooperation and Development (OECD) Convention on Combating Bribery of Foreign Public Officials in International Business Transactions. When the law comes into force, it will fill one of the main legislative gaps in the government's fight against corruption, which focuses specifically on private contractors that do business with the government. This anti-corruption drive will also affect business undertaken with state institutions (eg, Pemex and the Comisión Federal de Electricidad (CFE), the government-owned oil and power companies), and with the agencies in charge of awarding and handling infrastructure concessions (eg, the Ministry of Communications). The purpose of the law is to penalise individuals and companies, from Mexico or abroad, that engage in unethical behaviour in the context of government contracting in Mexico - the law refers to such actions as 'irregular activities'. Public servants are already subject to the Federal Law on the Administrative Responsibilities of Public Servants, but this statute is enforceable only in respect of wrongdoing on the government side, whereas OECD studies and international practice show that corrupt practices are more likely to originate with a contractor or concession holder. In seeking to be more active in regulating and overseeing contractors, Mexico is following an international trend. The Anti-corruption Law applies only at federal level, but at which nearly 70% of the federal budget is spent through contracts and concessions. It covers all forms of contract, agreement and concession; it even extends to the granting of permits, from the design, bid preparation, tendering and award stages to their execution and completion. It explicitly applies to Pemex and CFE contracts, and to infrastructure projects. Like most foreign legislation implemented by OECD countries, and following a trend that was started by the US Foreign Corrupt Practices Act, the law also applies to acts beyond the Mexican territory, covering irregular activities by national companies or individuals in international commercial transactions where a foreign official is involved. The federal agency in charge of enforcing the law is the Bureau of the Federal Comptroller, along with its internal comptroller departments which are integrated into most government agencies and public entities. The bureau is also in charge of enforcing the Law on the Administrative Responsibilities of Public Servants and supervising budget spending at federal level. The Anti-corruption Law empowers the bureau to punish persons and companies involved in irregular activity. This includes intermediaries, agents and consultants, but also extends to the beneficiaries of irregular activities - which will typically be Mexican-domiciled companies and their shareholders, parents and affiliates, whether foreign or Mexican. The law identifies eight forms of irregular activity. As well as bribery and peddling influence, these include a catch-all provision that penalises any action that involves obtaining - or has the purpose or effect of obtaining - an undue benefit or advantage in a government contract. 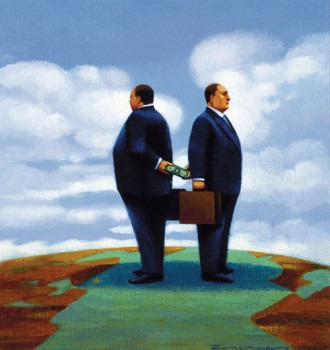 'Bribery' is broadly defined to include promises, undue influence or the giving of money or anything of value to a private contractor that is involved in the design, preparation or execution of a bid or public contract. Unlike anti-bribery laws in some other jurisdictions, the law makes no exception for facilitation or similar payments made to accelerate the receipt of a service or contract that would have been rightfully assigned or granted in any case. The law provides for large fines, which may be increased in proportion to the benefit gained. It also allows the authorities to blacklist individuals and companies, debarring them from participation in federal government contracts or concessions for up to 10 years. Fines imposed by the bureau will be treated as tax credits and may be collected pursuant to tax laws and regulations. The bureau's penalties are independent and additional to any criminal penalties which may be imposed following prosecution by the Attorney General's Office. The law provides for a 10-year statute of limitations. The law includes a leniency programme whereby individuals and companies involved in irregular activity may plead guilty to involvement and assist the bureau in conducting its investigation, thereby qualifying for a 50% to 70% reduction in fines. Anyone has standing to file a claim under the law. In practice, many claims are likely to be filed by the agency or public entity in charge of the government contract or concession in question. However, the law allows claims to be filed online, anonymously, or through the filing of a claim submitted under oath with respect to knowledge of the facts, the indication of evidence and information about the responsible parties - such a claim can be brought only by a private contractor, not by the government. The bureau is mandated to maintain claimant confidentiality. This factor is expected to encourage competitors to file corruption claims if there is reason to believe that a case for corruption may exist, although concerns remain about the submission of false information. A public servant must make known a fact or activity that violates the law; otherwise, he or she is subject to penalties under the Federal Law on the Administrative Responsibilities of Public Servants and is liable under the Federal Criminal Code. The bureau may start an investigation on its own initiative or on the basis of information provided in a claim. The law confers broad powers to request production of documents and information not only from government agencies or state entities, but also from third parties. For the purposes of its investigation, the bureau may access information that is classified or reserved under the Freedom of Public Information Laws and Regulations. If, on the basis of an investigation, the bureau can show probable cause of a violation, it must begin administrative penalty proceedings. Once notified, the defendants have 15 business days to file a plea in response. Thereafter, the bureau must allow the production and admission of evidence by the defendants under the terms of the Federal Rules of Civil Procedure. Thereafter, the defendants have five business days to submit closing arguments. The bureau will then have 10 business days to issue its resolution. In future, the law is expected to open up a broad area of practice in respect of claims and investigations. The coming months and years are likely to see the development of significant precedents and further legislation.